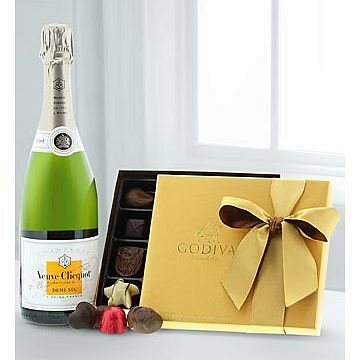 The Veuve Cliquot and Godiva Gift features Veuve Demi Sec, a slightly sweet style of Champagne, which is at its best when served with desserts. Marked by fresh peach, nectarine and orange blossom, it pairs beautifully with Godiva's® assorted deep dark chocolates, smooth milks, velevety ganaches, classic truffles and pralines. Truly irresistible! This gift includes the following: Veuve Clicquot Demi-Sec Champagne 750 ML and Godiva® 19-piece Gold Ballotin Assorted Chocolates.